Yes, it's exactly what it sounds like. 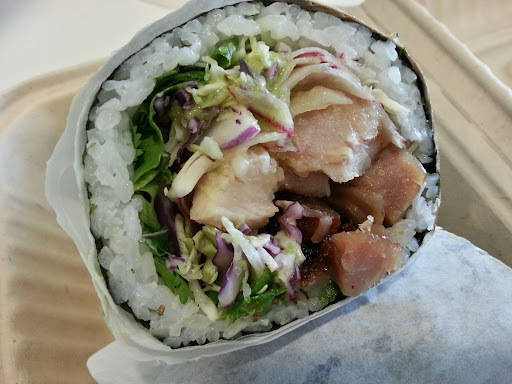 Sushirrito = sushi burrito. 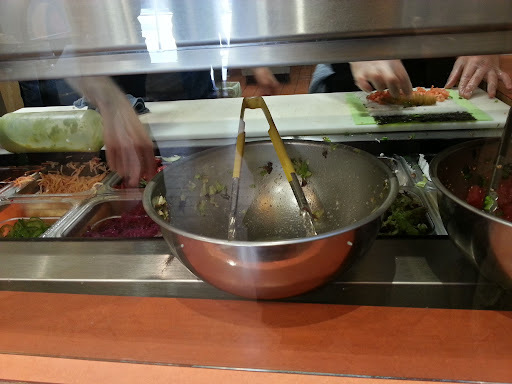 This super popular lunchtime spot in downtown SF has proven to be most difficult for me to get to. It's operating times (M-F 11a - 3p) and its insane line are the two biggest obstacles for me. A 20 minute line and I finally got into an area where I can see the menu! 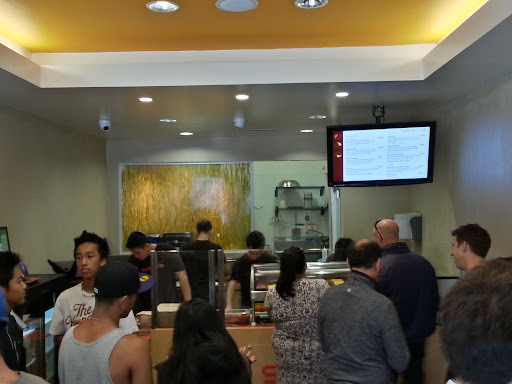 (It's popularity has forced it to open a second location a couple blocks down.) Sushirrito isn't exactly a burrito. It's more like a giant uncut sushi roll filled with various of fusion items. 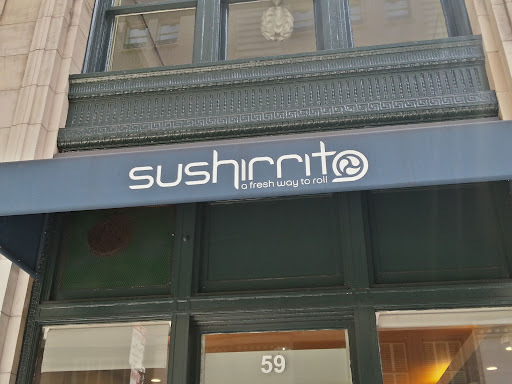 Originally, I was thinking I would order a roll with raw fish inside, but only two sushirrito rolls that had raw fish didn't seem too appealing to me. I was pleasantly surprised to find that the rice layer is thin and the rice is well seasoned, but not overpowering with vinegar. 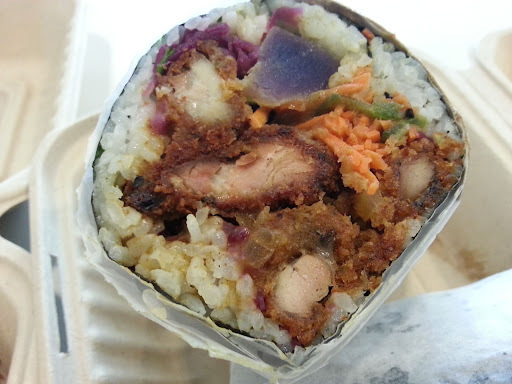 The Mayan Dragon sushirrito consists of chicken katsu, purple Peruvian potatoes, carrots, pickled red cabbage, avocado, shaved jalapenos, green onions with Japanese curry sauce lightly spread throughout the roll. 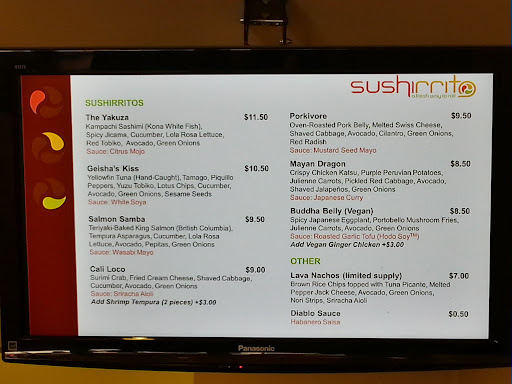 I love the concept of the sushirrito with the blend of these flavors, but the chicken katsu is so overcooked and hard, you could hurt your teeth. At first I was excited to see the purple Peruvian potatoes since this is the first time I've seen them on a menu since my trip to Peru, but these potatoes are known to be more firm and dense in texture. So these potatoes paired with the insanely hard chicken katsu made my teeth work overtime. I could see this being delicious if the katsu was cooked better. The japanese curry and jalapeno gave this burrito a subtle spicy kick.